The new carbon fiber skateboards from RollsRolls incorporate a new deck concept, provisioning for better riding and making them the lightest and strongest longboards currently available in the market. The deck lowers the center of gravity which provides better riding and ease of movement. Each model is priced differently and the prizes range from EUR138 to EUR410, and one article even mentions $350. The Woody 97 and Woody 85 both come with Randall Trucks 180mm; The Woody 97 sports 97mm ABEC11 Flywheels and the Woody 85 sports 85mm Seismic Speed Vents in Clear Blue. The dropped standing position of the beech deck also offers additional stability. The clever arch and concave designs provide a comfy match for any rider’s foot, minimizing the pains and cramps while maximizing control and movement, even when wearing shoes designed for barefooting. Even though the deck may be slightly smaller than with other boards, the “dropped” deck has superior flexing properties specifically manufactured to soak up the impact. Your feet will really love you for this. All of these factors make the Woody perfect for skating long distances. When you order, each board can be made to your specific requirements, so be sure to mention additional weight to ensure the flex would be perfect for you. The Sportster – the unbeaten board of world records in long distance skateboarding since 2003 – has a similar design, although a tad less curvy. It’s fitted with a carbon deck either with a black, red, or beige surface. The underside is Carbon/Aramid. 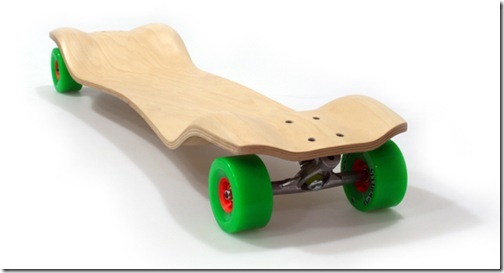 Just like the Woody, it sports Randall Trucks (alternatively get Holey) and ABEC11 97mm Flywheels. The lower dropped deck comes in handy with pushing, pedal, and foot breaking. As mentioned before, the low standing platform is not only an energy saver, but also controls speed. A superb feature in the Sportster is the highest stiffness around the longitudinal axis for guaranteed precision steering. The Carbon board will literally last you a lifetime as carbon does not “fatigue” – a common problem with wooden boards; making it the strongest and lightest longboard, at a mere 3.4 kg. The Aramid on the underside also ensures obstacles in the road won’t catch you unaware. You can be sure that with a Woody or Sportster Rolls Rolls Skateboard, the whole experience will be just as the site promised: skating on a cushion of air. You would never want to walk again… If these designs made you grab for your checkbook in an hysteric fashion, you would most certainly also enjoy reading FlowBoards Reinvent SkateBoarding and How To Build A Self-Balancing Segway Skateboard.